Turncoat is available as a download / CD audiobook via Recorded Books, Amazon US, Amazon UK, or Audible. HARDBACK / KINDLE VERSION: Turncoat is also available in hardback or Kindle book from Amazon US, Amazon CA or Amazon UK. 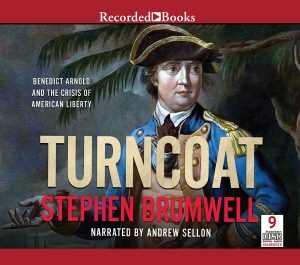 Narrated by American theatre, film, TV and voiceover actor Andrew Sellon, ‘Turncoat: Benedict Arnold and the Crisis of American Liberty’ by Stephen Brumwell is transformed into a 17-hour performance that’s available as an audio download or on CD. General Benedict Arnold’s failed attempt to betray the fortress of West Point to the British in 1780 is among the most infamous episodes in American history. Even today his name is synonymous with ‘traitor’. Arnold’s defection was all the more shocking because of his record as one of the Revolution’s bravest and most-effective fighters. But why did Arnold turn against his country and comrades? In Turncoat: Benedict Arnold and the Crisis of American Liberty, Stephen Brumwell challenges previous interpretations. See more about the book and its reviews.